Brief Synopsis – After an accident, a preacher moves far away from his home town, changes his identity and becomes a radio preacher that is quickly loved and respected by his new congregation. My Take on it – This is another film that I’ve known about for years and never had much desire to see what it was all about because the premise just didn’t sound interesting enough, but this series gave me the perfect reason to give it a try. 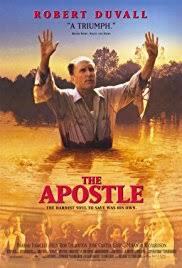 Robert Duvall once again shows how amazing an actor he can be and his performance is quite powerful even if it is over the top. He was deservingly nominated for an Oscar for this performance despite the fact that this film has little going for it besides his performance. The story is borderline boring and this move along much too slowly that some scenes go on for much too long. If this would have been edited better and shortened, it might have been more enjoyable. The dialogue is written well and we get a clear picture of the demigod nature of the main character and combined with Duvall’s performance, we can see such a powerful identity for a character. We can see how he craves the love of those around him despite the fact that he is far from perfect even when he gives off the impression that he cannot do wrong. This was not easy getting through due to the slow nature of it all yet Duvall’s performance is worth watching at least once. Bottom Line – This is a well acted film but the story just isn’t interesting enough, Duvall is amazing in the lead role and I can completely understand how he could get an Oscar nomination for Best Actor for this performance, but the story itself is quite lacking. The dialogue is done quite well to try and give us the impression that we are watching a demigod who needs to feel the love of those around him despite the fact that he is far from perfect. The story moves along much too slowly for its own good and could have been edited much better.